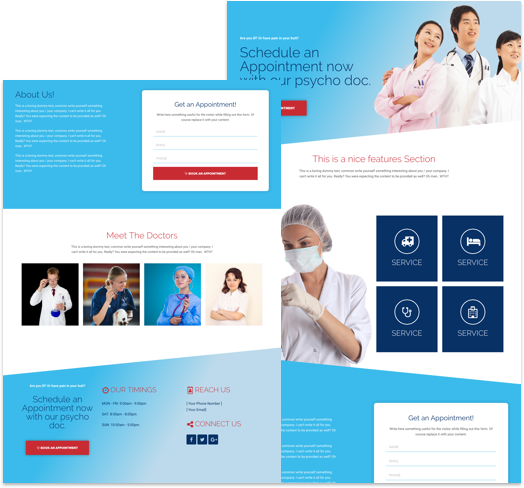 A professional landing page divi layout for medical, clinic or related niches. Of-course this could easily be adopted to any other niche / website as easily as our other divi layouts. 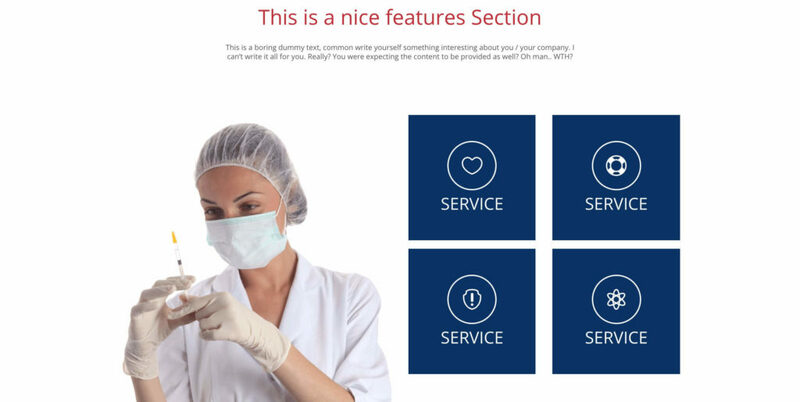 This is a professional & attractive divi layout for medical related niches, you may however use it for any niche by tweaking the color scheme and replacing the images. Note: This layout is basic responsive which means that it should look fine in mobile & tablets however you can optimize it further as per your need and make it look even great easily via the divi responsive settings. You must have Divi Theme / Extra Theme or Divi Page Builder installed to use this layout. This is a 2 column section with shape divider ( using css code you can find in the section setting’s custom css box ) which make it appealing. There is an image used on the right, however you may also use an appointment form or video in place of that as suit to your need. A 2 column section the service boxes are done using the blurb module. This section is using white background to make the content and features more prominent. This is also a 2 column section with shape divider on the top. The Divi Form module is used for creating the appointment form here. Here you can display the doctor’s profiles. These profiles are done using blurb module, the hover effect you see is all done with custom css code just which you may find in a code module added at the bottom of the page. This is a 3 column section using shape divider on top. You can customize the information you want to display in each column as per your need. Simply download & import the “.json” file in the divi layout library and than apply / add it to your page. External links on this website may be affiliate links that could result in us receiving compensation (payment) when you purchase a product or service from that link. This helps us to pay the bills and keep maintaining this great service for you. You do not pay any extra fee’s for these items. Divi is a registered trademark of Elegant Themes, Inc. This website is not affiliated with nor endorsed by Elegant Themes. Elementor is a registered trademark of Elementor, Inc. This website is not affiliated with nor endorsed by Elementor.